– Inspect the ATM, gas pump, or credit card reader before using it…be suspicious if you see anything loose, crooked, or damaged, or if you notice scratches or adhesive/tape residue. – When entering your PIN, block the keypad with your other hand to prevent possible hidden cameras from recording your number. 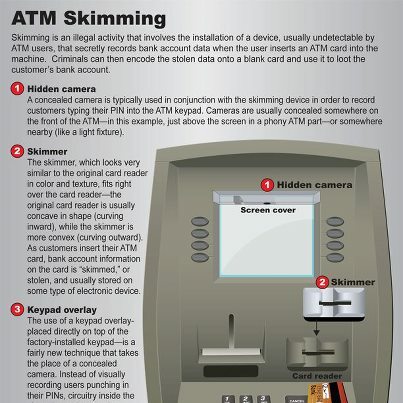 – If possible, use an ATM at an inside location (less access for criminals to install skimmers). – Be careful of ATMs in tourist areas…they are a popular target of skimmers. – If your card isn’t returned after the transaction or after hitting “cancel,” immediately contact the financial institution that issued the card.